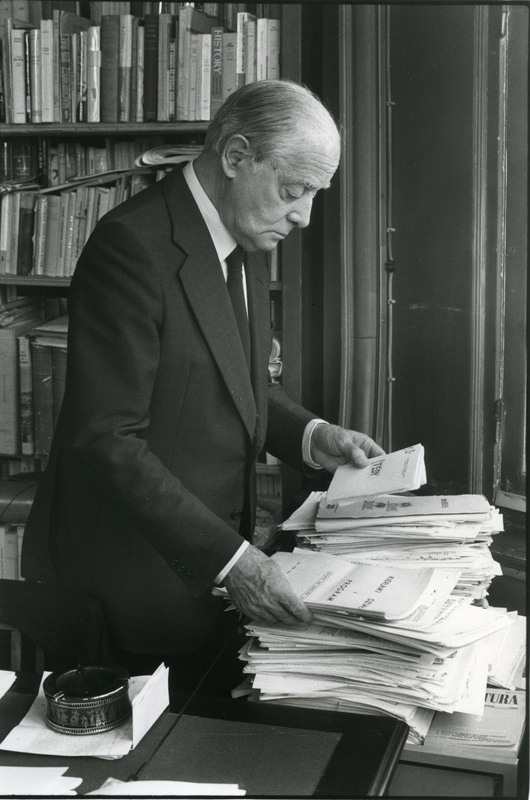 Jerzy Giedroyc believed that through publishing he could best influence Poles and other East Europeans on either side of the Iron Curtain. He noted that “The free word has decisive significance”. The three pillars of his activity within the Literary Institute were Kultura, the monthly journal, Zeszyty Historyczne (Historical Notebooks) – a quarterly journal primarily concerned with modern history, and the books published within the Biblioteka Kultury (Kultura Library) series. 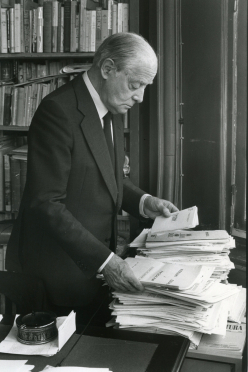 Through his publishing policy Giedroyc sought to offer his readership material that was politically resonant, “in keeping with contemporary realities” in Poland, East-Central Europe and the world, and delivered intellectual stimulus. His publishing choices were governed by artistic merit, subject matter, and political importance. Giedroyc's post-war publishing achievements can be divided into two phases – the first in Italy, the second in France. Such was the Italian name for the Literary Institute that came into being in Rome and whose output was geared towards the needs of the Polish military, but at the same time to building its own publishing programme. This began with a new edition of Henryk Sienkiewicz's Legiony (The Legions) and Adam Mickiewicz's Books of the Polish Nation and Polish Pilgrimage with a preface by Gustaw Herling-Grudziński. Casa Editrice Lettere launched four separate book series: Biblioteka Społeczno-Polityczna (on political and social issues), Biblioteka Wiedzy (reference and general interest), Biblioteka Przekładów (seminal works in translation) and, for the Italian market, Capolavori della Letteratura Straniera (masterpieces of world literature). The first issue of Kultura, initially conceived as a quarterly, came out in June 1947 under the joint editorship of Jerzy Giedroyc and Gustaw Herling-Grudziński. The Institute’s characteristic colophon conceived by Stanisław Gliwa – the upper part of an Ionic column with the initials ILR – appeared on the covers of its publications. During its relatively short period in Rome, the Institute published 24 titles. Among the authors were Wacław Berent, Jan Bielatowicz, Leon Blum, Juliusz Kaden-Bandrowski, Arthur Koestler, Bolesław Miciński, Sergiusz Piasecki, Władysław Reymont, Andrzej Strug, Wacław Sieroszewski and Jerzy Stempowski. Once in France, Giedroyc readjusted his editorial priorities, giving greater prominence to Kultura and transforming it into a monthly journal. Book publication became a secondary consideration, although two titles provoking intense discussion did appear. The first was Aleksander Janta-Połczyński's Wracam z Polski (My Return from Poland) and the second Melchior Wańkowicz's Klub Trzeciego Miejsca (The Third Place Club). Two further titles, Józef Czapski's Na nieludzkiej ziemi (The Inhuman Land) and Weronika Hort's Dzieci tułacze (The Wandering Children), recalled Polish war-time experiences in Soviet Russia. James Burnham's Struggle for the World also appeared at this time, following its author’s meeting with Giedroyc and Czapski at the Congress for Cultural Freedom in June 1950 in Berlin. In the years 1948–52 the total number of books published was, however, no more than nine. In 1953, a watershed year for the Literary Institute, the Biblioteka Kultury series was launched with the publication of three books – George Orwell's 1984, Czesław Miłosz's The Captive Mind and Witold Gombrowicz's Trans-Atlantyk. The launch coincided with the death of Stalin, an event which came to shape the Institute’s future output and political content. Events unfolding within the Soviet Bloc stimulated the initiation of three sub-series within the Biblioteka Kultury series – Dokumenty (Documents; begun in 1959), Archiwum rewolucji (Archive of a Revolution; 1964) and Bez cenzury (Uncensored; 1977). These publications performed a dual role. On the one hand, they offered a critique of communism from both a current and a historical perspective. At the same time they gave an analysis of the roots and development of breakthrough events in post-Stalinist Poland, from the rise of revisionism to the formation of the democratic opposition. Anti-totalitarian literature was represented by such authors as Raymond Aron, Zbigniew Brzeziński, Albert Camus, Milovan Djilas, Leszek Kołakowski and Wiktor Sukiennicki. The truth about the Soviet prison camp system was laid bare in books such as Herling-Grudziński's A World Apart or Solzhenitsyn's First Circle, Cancer Ward, and the monumental Gulag Archipelago. Further books from Russian and Polish authors, “literature without borders and censors”, were published. Pasternak's Doctor Zhivago became the Institute's all-time bestseller. Meanwhile, the samizdat work of Russian dissidents Sinyavsky, Remizov, and Daniel, first published by Giedroyc in Polish, brought the Institute international recognition and were translated into many languages. After the arrest and trial of Sinyavsky and Daniel, Giedroyc mounted an international campaign to secure their release. In viewing Polish writing as one body of literature, rather than treating it as divided into émigré and indigenous (which the communist authorities went to great lengths to promote as a concept) Giedroyc was able to restore and preserve its cohesion. His stable of authors accordingly echoed this inclusive approach. Émigré authors Gombrowicz and Miłosz were the central pillars, the latter gaining the Nobel Prize in Literature in 1980. The writing of Józef Mackiewicz was much valued. Andrzej Bobkowski, Gustaw Herling-Grudziński, Konstanty Jeleński, Leszek Kołakowski, Sławomir Mrożek, Jerzy Stempowski, Czesław Straszewicz, Jerzy Wittlin, and Zygmunt Haupt were constantly being coaxed to present their work for publication, as was the poet Kazimierz Wierzyński. Younger émigré poets such as Czajkowski and Czerniawski were recognized. The contributors to the Biblioteka Kultury series included some of the most talented writers living in Poland at the time, perhaps most notably Stanisław Barańczak, Zbigniew Herbert, Marek Hłasko, Stanisław Mackiewicz, January Grzędziński, Kazimierz Orłoś, Bogdan Madej, Marek Nowakowski, Jakub Karpiński, Wojciech Karpiński, and Adam Zagajewski. In 1962 a new periodical was launched that reflected Giedroyc's passion for history. Initially, Zeszyty Historyczne (Historical Notebooks) appeared as a bi-annual journal, and from 1973 as a quarterly. Each issue was given dual numbering that indicated its position within both Zeszyty Historyczne and Biblioteka Kultury (Kultura Library). Jerzy Giedroyc died while working on the 637th issue of Kultura and the 134th of the Zeszyty Historyczne. Kultura Library ran to 378 titles.